A UN humanitarian helicopter prepares for a day of work, at the airport in the Mozambique city of Beira, March 22 2019. Some hundreds of people are dead, many more still missing and with many thousands at risk from massive flooding in Mozambique, Malawi and Zimbabwe. Relief supplies are arriving for thousands of people in southern Malawi’s Cyclone Idai-affected flood areas, where at least 56 people have been killed. Many villages remain cut-off by massive rains that hit Mozambique’s coast earlier this month, swamping huge areas of the country and neighboring Malawi and Zimbabwe, killing hundreds. The United Nations says about 1,200 Mozambicans fled across the border to evacuation camps in Malawi, where relief supplies are under strain. Malawi’s Department of Disaster Management and Preparedness says nearly a million people in half the country’s districts have been impacted by Cyclone Idai. Half of them are children. UNICEF partners - including Doctors Without Borders, the Red Cross, United Purpose, and World Vision - are helping deliver relief supplies. Brown says these include oral re-hydration solution, antibiotics, and insecticide-treated bed nets. Some hundreds are dead, many more still missing and thousands at risk from massive flooding across the region including Mozambique, Malawi and Zimbabwe caused by Cyclone Idai. UNICEF last week made an urgent appeal for $8 million in funding to meet the immediate and medium-term needs of women and children in flood-affected areas. Authorities say some areas of Malawi, like Nyachikadza and East Bank, are inaccessible due to cut-off roads and washed-away bridges. District Commissioner for Nsanje Reinghard Chavula says getting aid to those in need is a challenge. “We had a help of a helicopter and we were able to send the food through the helicopter but still what we need are the roads to be maintained otherwise we can’t have the helicopter all the time," Chavula said. Despite the relief efforts, Chavula says thousands in Malawi are still in dire need of shelter, food and medical assistance. 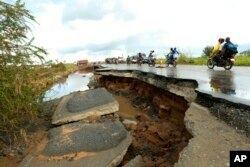 Malawi President Peter Mutharika declared 14 affected districts disaster areas and appealed for help. Aside from aid groups and the U.N., countries offering assistance include Britain, China, Tanzania, and the United States.